Complete the look of your new bathroom. Posted By Edward, 9th Nov 2016. 3 Minute Read. The tiles you choose for your new bathroom can have a dramatic effect on the overall look and feel of the room. Tiles create the colour and pattern of your room's canvas and the right tile choices can really take your bathroom design to the next level. Tiles are a great way to style a new bathroom however if you're thinking about ways to update an existing bathroom then changing the tiles is a great option. Updating your tiles is a quick and cost effective way to renovate your bathroom; especially if you're renovating your bathroom in preparation for selling. Mosaic tiles are one of the best ways to create a beautiful feature in your bathroom. A great example of this is to use mosaic tiles to tile the area behind your basin. Another idea is to tile the area inside a shower enclosure or an alcove in your bathroom. Mosaic tiles can add colour and spice to your bathroom design. One thing to remember however is to use this style of tile sparingly; a small sprinkling of mosaic tiles can actually be more effective than using them to tile your whole bathroom. Metro tiles are a really popular tiling choice. Originating from the subway stations of New York at the start of the 20th century; metro tiles (or subway tiles as they are sometimes known) are perfect for any style of bathroom. Whether you are planning a contemporary styled bathroom or you have your heart set on a more traditional space; metro tiles could be the ideal backdrop. Metro tiles can be used to tile your whole wall in one colour or for something a little more quirky why not consider using two different tile colours on the same wall. Either tile the top of your wall in one metro colour and the bottom in another or maybe alternate colours tile-by-tile to create a border around the middle of your bathroom walls? Porcelain wood effect tiles are harder-wearing, easier to maintain and more cost effective than real wood. There are lots of colour variations to choose from including both lighter and darker woods. A light wood effect floor is a nice option because it really helps to open up the space in your bathroom. A nice idea for wood effect tiles is to tile both the floor and one bathroom wall with the same tile colour. This technique can have a dramatic effect; especially if you tile the wall that faces the entrance to your bathroom. Hexagon tiles can give your bathroom a unique and original look. Hex tiles (as they are sometimes referred to) are an emerging trend that's just starting to gather pace. 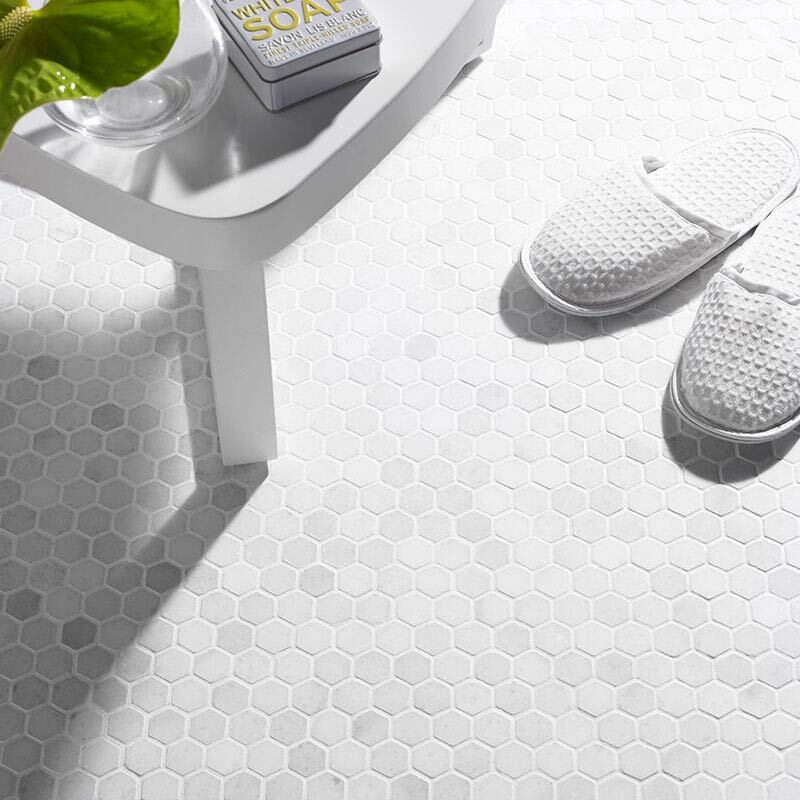 If you opt for hexagon tiles in your bathroom then you'll definitely be ahead of the curve and bang on trend. Hexagon tiles are sold as individual tiles and also as tile sheets. Tiling using the sheets is ideal as it's a real time saver, however the advantage of tiling using individual tiles is that you could potentially create some unique patterns that show off your individual creativity. 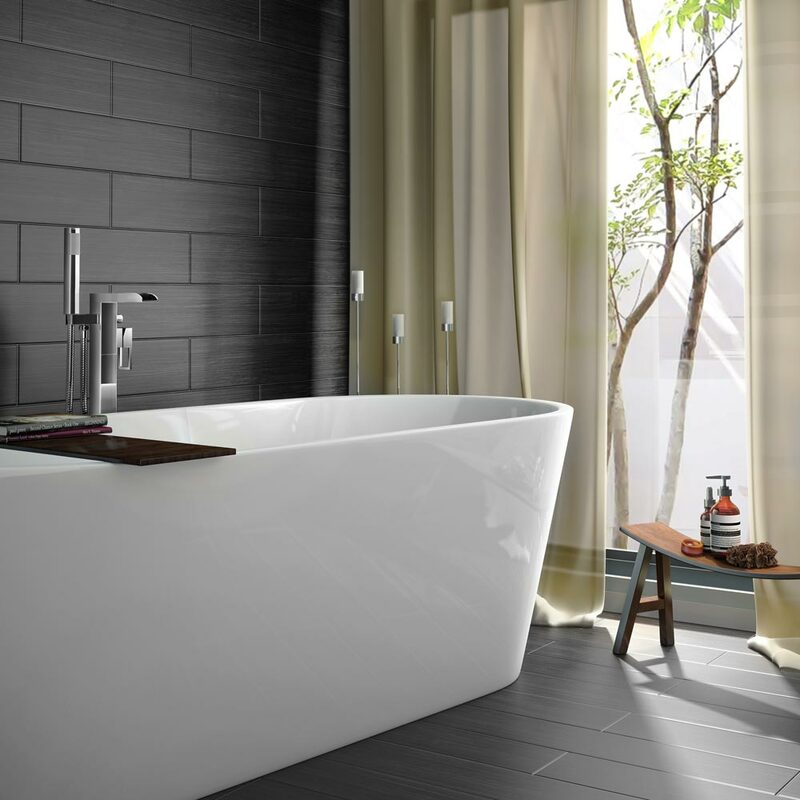 The popularity of grey bathrooms continues to soar. As a result, grey tiles have become really popular too. There are now more grey tiles options than ever before so you're sure to find a style that's perfect for your own home. Grey metro tiles are very popular for the reasons stated above however another option is to go for grey stone effect tiles. This style of grey tile adds a gorgeous gradient texture to your bathroom that's sophisticated yet understated. 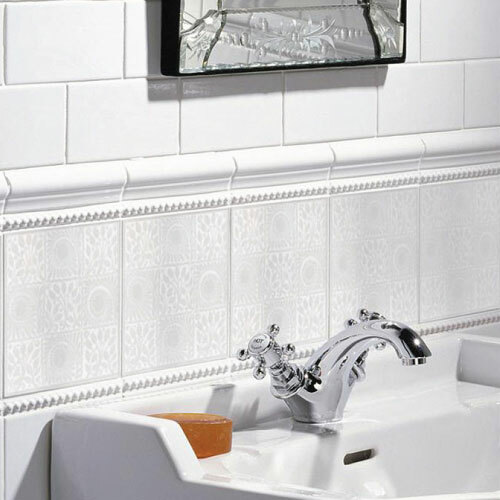 Border tiles are brilliant at breaking up the look of your bathroom. A great way to use them is to tile across the middle of your walls. This technique works really well to break up a wall that uses the same tile floor to ceiling. 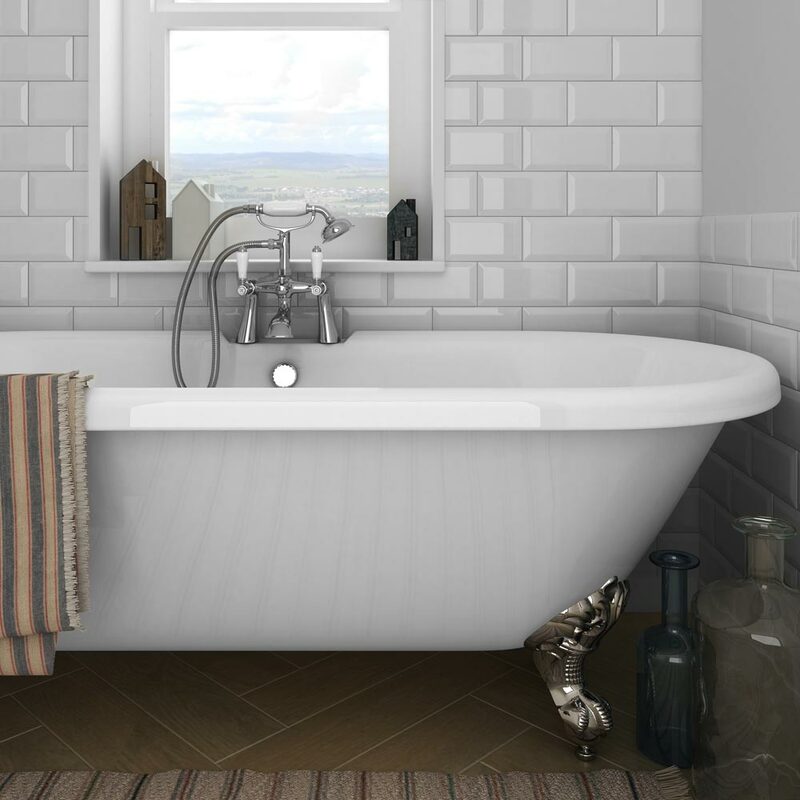 There are some gorgeous border tile options available at Victorian Plumbing; the traditional options in particular work so well with a period styled bathroom. 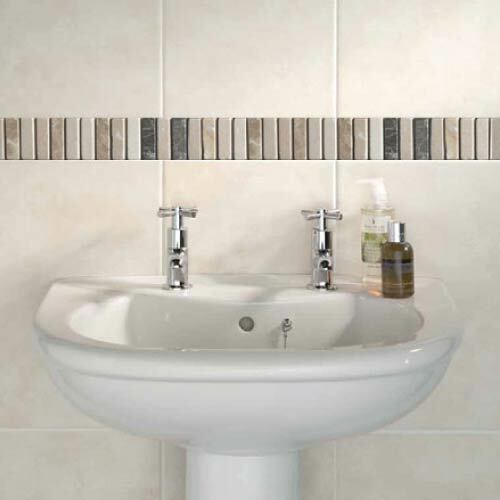 Border tiles are a lovely way of subtly expressing your creativity and adding authentic character to your bathroom design. 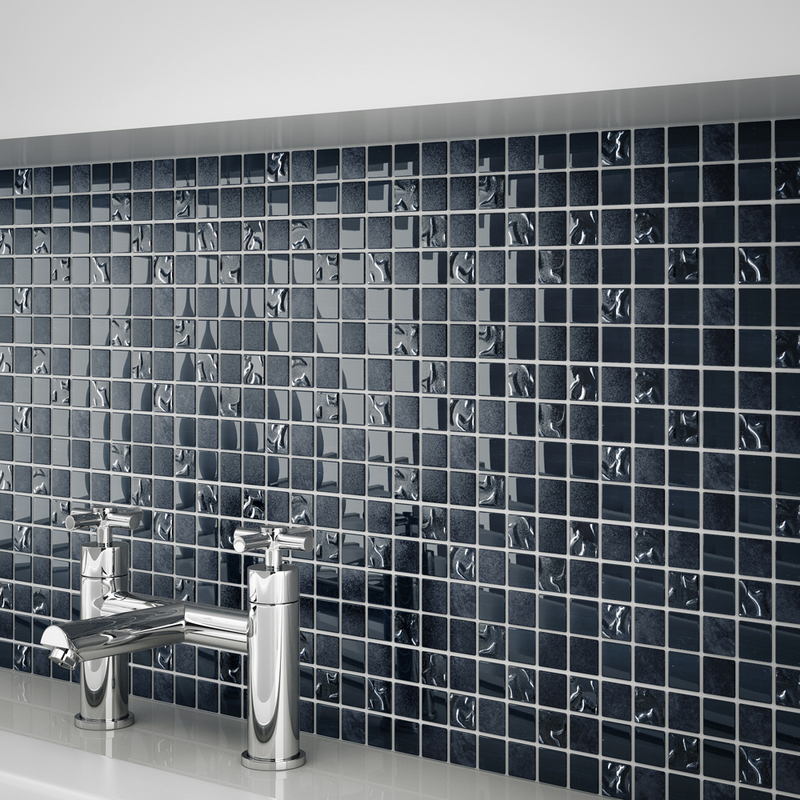 Continuous tiles are not specifically / exclusively floor tiles or wall tiles; they are tiles that can be used for both! You'll find lots of tiles will be advertised as either floor or wall tiles however the reality is that that the tile can be used for both. Tiling both your floor and walls the same is a great technique for making your bathroom appear much bigger than it actually is; a really good tiling idea if you're designing a small bathroom. 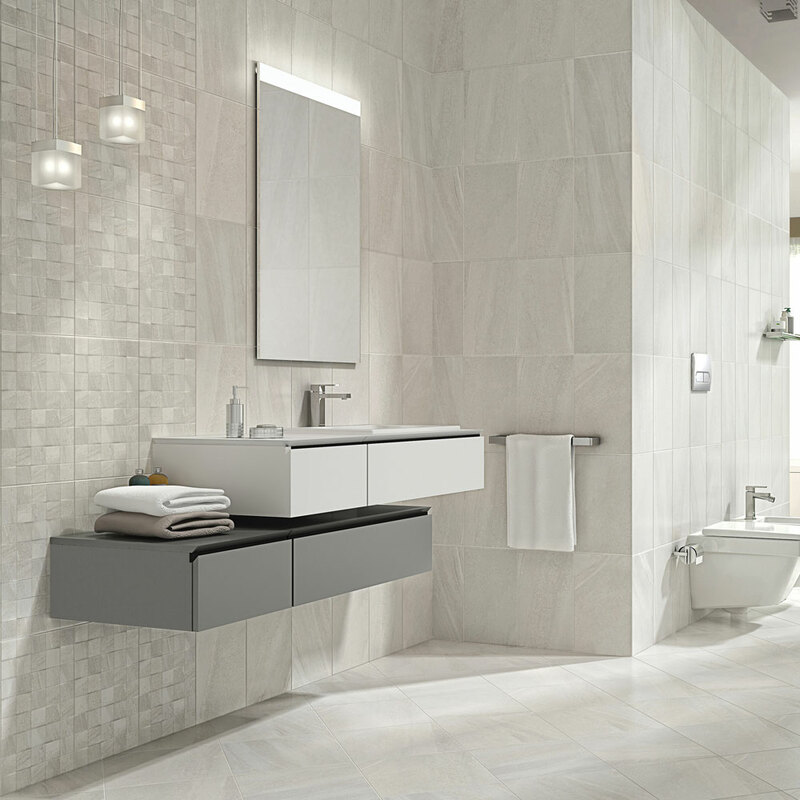 Popular continuous tile colour choices include white, neutral or grey coloured tiles. Whether you are designing a rustic style bathroom or you simply want to add a rustic element to your bathroom design; rustic tiles are all about creating that warm natural feel in your bathroom. There are some very cool rustic tiles on the market right now so choosing ones that complement your personal style is the key. Why not use exposed brick tiles to create a feature on just one wall of your bathroom? 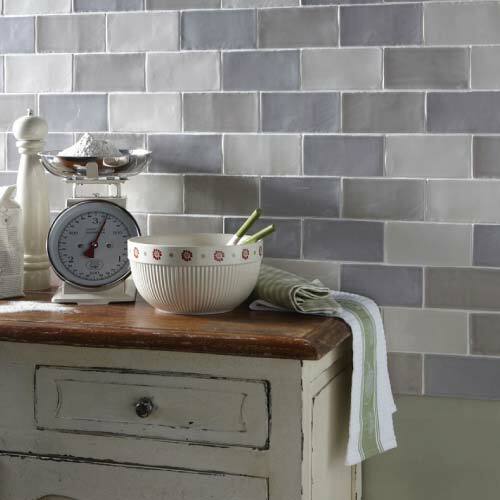 Another clever designer trick is to use rustic tiles on the wall behind a brightly coloured vanity unit or cabinet. If you're a follower of the Victorian Plumbing Pinterest page then you'll have seen lots of great examples of customers using bohemian tiles (occasionally shortened to boho tiles) lately. Bohemian tiles are wall or floor tiles that have intricately designed patterns on them. These nomadic, floral patterns are inspired by everything from 19th century Victorian era art to the beat poets of the swinging 60s. Boho tiles provide a beautifully rich footprint in your bathroom that looks both unique and bespoke. Use this style of tile if you’re looking to make a bold statement without the risk of overkill. Are you looking for something completely different in your bathroom? Geometric tiles are literally on another level. These uniquely shaped tiles are another emerging trend that's considered very cool. Similar to boho tiles, geometric tiles can bring a unique texture to your bathroom. 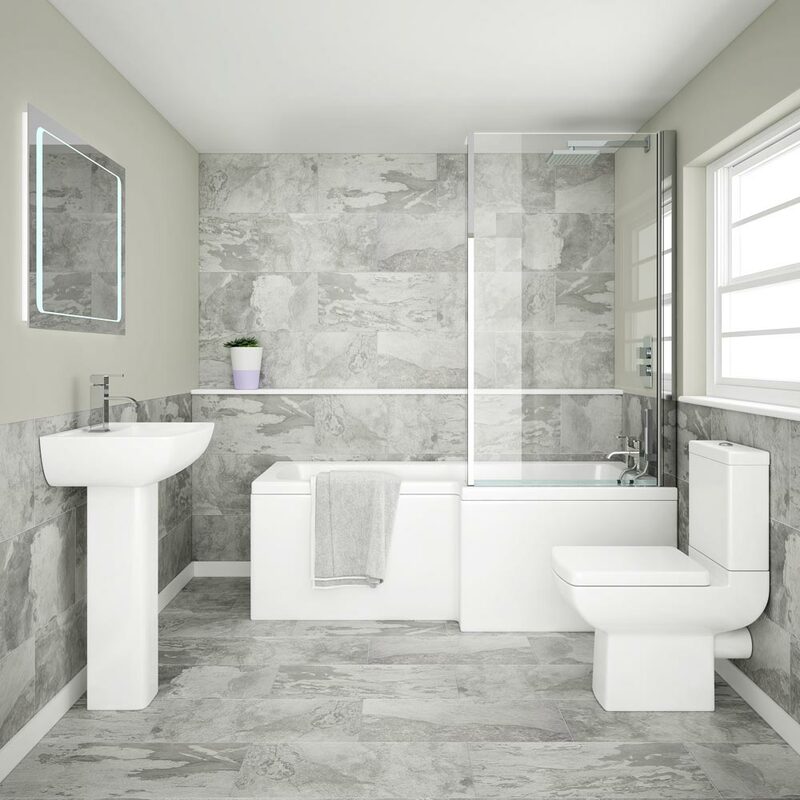 If you choose this style then expect a good few 'wows' when you unveil your new bathroom to family and friends. I really hope you have enjoyed reading our bathroom tile ideas. There is so much choice out there but hopefully this guide has made your mission to find the perfect tile a little easier. Don't forget that if you find a tile you like on our website then you can order a sample to check it out before you place your order. Thanks for reading and good luck. A guide to electric shower kW ratings to help you choose the right one for your bathroom.